With our newest exhibit, 4th MFA Biennial, we asked a few of our student artists some questions about their process. [Brea Art Gallery] What and where are you studying? [BAG] Have you always wanted to be an artist? Who were your early influences? Yes, I always want to be an artist since I was three years old. When I was in high school, I had a lot of interests in Abstract expressionism marked by abstract forms, expressive brushwork, and huge scale size. Especially, the first generation of American Abstract Expressionists Clifford Still was very early influential for me. I like his quote. He said that “I never wanted color to be color. I never wanted texture to be texture, or images to become shapes. I wanted them all to fuse into a living spirit.” It really hit me. Since then, I am trying to establish my own visual language contains artistic trueness from my genuine and unadulterated perspective, instead of forcefully trying to appeal to the masses. [BAG] Describe your process in making a piece. I think the most important process is “inspiration”. When leaving home and heading toward my studio in LA, I start a new treasure hunt because a lot of subject matters are distributed and hidden around the common scenery. Most of my artworks are a re-interpretation of the morphology of specific architectural typologies as an immigrant artist point of view. Specifically, in California, the world outside has a fascinating mixture of unfamiliarity and eccentric mood that conveys artificial and industrial flavor. It also has an intangible air of rigidity from the stereotypical architect, including the low buildings well painted neutral color, the cookie-cutter housings clustered together, the uniformed stores and shops along the deserted street. I also actively interact with a strong sense of disorientation from the magic hour in California. The more the dazzling sunlight is bouncing off the rectilinear structure, the reflection of the surface color dazzles me. Although the scenery out the car window passes very quick glance, It is beautiful. I enjoy discovering and trying to collect all inspirations from the outside. In order to bring the exact moment to my studio, sometimes I instantly take a photo or record my emotional response with my own voice in the car. My studio is an optimized place for inspiration to get on my wings of an emotional experience and to embody artistic delight through my visual language. I conceptually embrace two aspects. I orchestrate by deconstructing the monotonous elements of industrial uniformity for making a joyful rhythm, incorporating with my emotion. I also, sometimes, keep intact the large hard-edged geometric shapes driven by industrial aspects to visually present a sense of discomfort, incorporating contrasting and dazzling colors In order to express these pleasurable moments and strong emotional responses. Influenced by Gerhard Richter, I embraced intuitive organic movement by squeezing various mixed pigments. I also Intentionally placed tape stencil and residue as an intuitive gesture on the surface. [BAG] What are you focusing on right now in your practice? During the first semester, I was more focusing on researching information from a variety of different sources related to my interests and understanding the philosophy of many influential artist. Going through this process, I realized that I am staying in my comfort zone. Therefore, I envisioned that the most urgent thing in my practice is to escape from the comfort zone rather than the changing of the scale by my intuition. I forced me out of my comfort land, making a lot of small thumbnail artworks with various and diametrical approaches. Also, I enforced a brave gesture into my process, such as cutting or breaking the finished painting without any plan. Honestly, that was the scariest part because I can’t make any definite commitment after deconstructing the form. Recently, In terms of the architectural aspects in my artwork, I am slowly taking a notion of scaling up my artworks. I believe that this is a good opportunity for making big scale artworks and it would be also another way of escaping my comfort zone. I hope I can show the big scale painting at my next exhibition. [BAG] What is one gallery or museum would you love to exhibit a solo show at? I do not care about a specific space type. I think every gallery and museum has their own beauty. However, since I found art to be a great instrument in my life as an immigrant, I have long desired to communicate through my visual language to Korean people in the United States. If I have a chance to exhibit a solo show, I would like to have nearby K-town. [BAG] Who do you credit for encouraging you to be doing what you're doing right now? My husband encourages me the most, financially and mentally. He loves art world. He really likes to come and work in my art studio as well instead of his office. So, sometimes he came to my school together bringing his work documents. And I offered a little corner spot to him to work during my class. [BAG] Why do you make art/study in Southern California right now? My husband got offered from his company and we moved to Southern California. [BAG] Where do you see your work heading in the future? I've been an artist as long as I can remember. I explored other options in college because art felt like a risky career choice. But in the end, I couldn't stay away from the studio, it's always been the most fulfilling place to be. Currently, my process is very intuitive and spontaneous. I start with a specific found material and make monotypes with several layers, making choices for the next layer based on what happened during the previous pass through the press. I am focusing on experimental printmaking and moving toward a mixed media practice. I am thinking about formalism and the formless, ways of mark-making, and how to incorporate 3D new media processes into my practice. My family and friends have always been very supportive of my arts career but I also credit friends I made during a residency several years ago. They were the first to really encourage me to take my practice more seriously and pursue an MFA. I moved to LA to experience a larger art scene and a new culture. 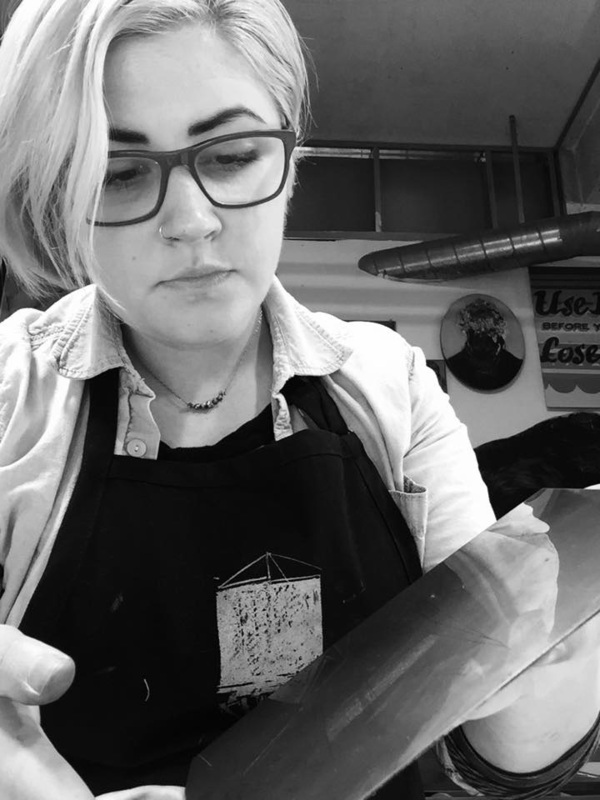 Because my practice is heavily rooted in printmaking, I also wanted to be part of a good community of printmakers and have access to a great studio. CSULB is unique in that it offers both. I'd like to push my tendency to create work influenced by my environment. This might require more travel and residency opportunities that allow me to respond to new natural ecologies or urban landscapes. I would also like to see my work translated into public art somehow. Now that I am almost finished with my degree, I'd like to collaborate on projects with other artists as well. Sarah Hassan Khanii: I am studying MFA in Illustration at Cal State Long Beach. Yes. My early influences come from when I was a kid and my father used to paint. He wasn’t a professional painter but, he made me in love with painting. When I was a teenager I was really interested in literature and painting both. I wanted to be an artist who write and paint like Shel Silver Stein who was my favorite that years. I am from Iran and Iran’s folklore has always been the greatest inspirations for my artworks. Aside from Iran’s long-standing civilization, it has been constantly exposed to many civilized and barbaric nations, which can lead to arts as it is filled with original artistic and aesthetic imagination. The stories my father used to tell me as well as outstanding Persian stories like "Shahnameh" and "Thousand and one night" which are stories full of myths, heroes, and fantasies, have been really good inspirations for my artworks. These imaginary stories have propelled me towards Illustration and painting which are rich with unprecedented multitude of experiences because they give me many facilities to depict my imaginations and these fictional stories. The other artist who influence me a lot when I was so young was Kathe Kollwitz, who had depicted a period of history from a feminine perspective. Kollwitz portrays fear, love and hope in the real world and I was seeking to portray fear, love, and hope in the fantastic world of legends. My process always starts with freewriting and sketches in my sketch book and color scripts. After some days, I start making abstract compositions with abstract shapes and colors on my real scale and then I start transforming that abstract composition to my elements. I am focusing on two projects right now. The first one is a series of mix media large scale drawings based on the concept of immigration. It is mostly about a person’s feelings after leaving home and his or her memories. I left my country to study art here so I have felt some of those feelings. Therefore, my personal feelings inspire me for this project more than anything else. The other project that I am working on is a series of psychological portraits based on the personality of female characters of “shahnameeh” (The Book of Kings). which is a long Persian poem full of, mythical, heroic and historical stories from the old Iran like my last project which you showed in your 4th MFA Biannual. I found this subject interesting, primarily because Iranian legendary heroines, like Iranian women have always been subject to various restrictions and these women are always in shadows. I want to insist on these female presences in a male dominated culture. Men are real heroes of the stories of this book. But, this time I want to extract these women and show them not as a shadow behind these men. I want to show them as individual characters with their all power and weaknesses. This project is going to be for gallery show and each frame has a statement about each character because I am doing in for American audience. My family who have always been my biggest support. At this point in time I feel the need to know the contemporary visual arts, culture and literature of different nations; and making connections with every new culture I meet is what I am striving to achieve. A developing interest in studying in a multicultural context and the desire to learn about the art, culture and literature of different nations and to gain new experiences in the field of Illustration and painting and to create new works based on such an understanding has prompted me to think about studying in America. I am constantly concerned with the question as to how could I, taking advantage of Illustration, drawing, literature and culture in such a way that my works belong to contemporary era? How could I, taking advantage of New Media Art and the opportunities that technology provides us, add a new valuable dimension to my works? For me, as one who has spent some years drawing, painting and illustrating passionately in Iran and now in need of new experiences the new and dynamic environment at Cal state Long Beach is really amazing. I learning and experiencing to gain an understanding of my international audience and to extract opportunities from the media surrounding me to get closer to my goals and to achieve creative functioning in my work. I see myself as a freelancer artist who travels a lot, have Gallery shows all around the world specially in New York and LA and knows about different cultures and show the world around me in my works from a feminine perspective. I like to take a step to improving the lives of women. By being a successful woman at first. Then, I will have a louder voice to talk about women issues with my art in the future. 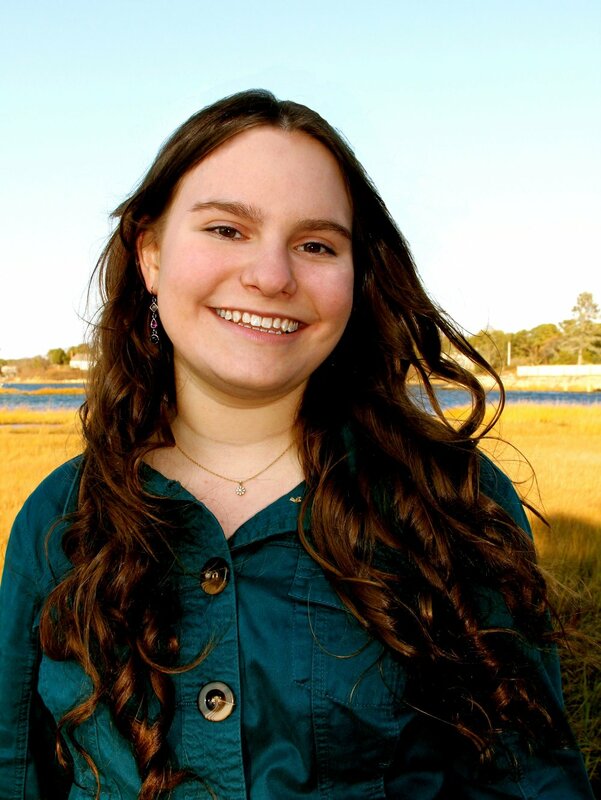 Madeline Arnault: I am studying art at Claremont Graduate University. My main material is fiber; I sew most of my work. I’ve always wanted to do something creative. My parents were my role models growing up. They have made successful careers in theater and are always thrilled with a new opportunity to express themselves through their art. They always included me growing up. I acted, painted sets, set lights, and sewed costumes. They even recruited a costumer to give me sewing lessons, giving me a great foundation for my current work. I draw a lot. Little doodles on the sides of notebook papers, multiple sketchpads litter my workspaces, and my electronic devices are filled with designs. Not every work begins from a sketch but they do influence my thinking process and how I start out. As my work is sewn often I live with a piece pinned together for several days or weeks. Once decided I’m quite fast, sometimes making decisions on the fly and dealing with the consequences later. That’s how I ended up with such a big piece hanging in the gallery right now; I just kept adding more rows of red! Right now I’m focusing on the interactions of patterns from different cultures. Some differences become extremely apparent when combined while others fade into the background. My parents again. They have never failed to be encouraging. It is because of their support I received sewing lessons and pursued art in college. They’ve taken every change in my work in stride and always encouraged me to do more, explore more, and try more. I moved to Southern California for school. It is so different from New England. Everyone is so friendly and open to helping. I’m planning on staying after finishing my degree. Upon attending Claremont Graduate University my work changed drastically. Case in point I switched from mostly three-dimensional humanoid forms to quilting. Apart from continuing to work in fabric I really have no idea what could happen! See more of Madeline's work here. Thanks to these very busy student artists for taking time to chat with us. And if you haven't had a chance to see their stunning work in person, be sure to catch the 4TH MFA Biennial at the Brea Gallery before it closes March 25th!